A review copy was provided by the publisher in exchange for an honest review. All opinions are my own. Any quotes contained in the following review are from the advance copy and are subject to change. As its title implies, this novel is a bit of an oddball. Even the style of it reminds me a little of a children’s storybook, complete with its own whimsical fairy tale message: Your eyes only see what your mind wants to see, so sometimes all it takes is a change of perspective. Or, if you’d like: Magic is real, if you just look for it. The book starts with an introduction to the saddest protagonist ever. Wil Morgan is literally the kind of guy who has dreams about coming in second in a World’s Biggest Failure competition. He’s crotchety, cynical and unimaginative—but that didn’t used to be the case. His childhood was filled with hopes and dreams, and his mother the brilliant jet propulsion scientist Melinda Morgan always encouraged him to reach for the stars and believe in the possibility of magic. But the year he turned ten, Melinda died in a laboratory accident, leaving young Wil in the sole care of his father who is as different from his mother as can be. Barry Morgan, who was never an outside-of-the-box kind of man to begin with, became even more paranoid and set in his ways after the death of his beloved wife, fearing that he would lose his only son too. He essentially forbade Wil to have an imagination, setting the boy on a path to a safe and unadventurous life. And so this was the story of how Wil came to be in his boring, miserable, and uninspired existence. But a part of Wil has never given up hope. He still wants to believe in the possibility of magic. Maybe that’s why he became a private investigator in defiance of his father who wanted him to be an accountant, even though being a PI pays poorly and he is stuck working out of an office building whose elevators smell like rat vomit. One day though, Wil gets a new assignment from a strange man called Mr. Dinsdale, who claims to be the curator of the Curioddity Museum. Even though Wil secretly thinks the man has lost his marbles, he reluctantly accepts the task of finding Mr. Dinsdale’s missing museum exhibit, something called a “box of levity” (as opposed to gravity). 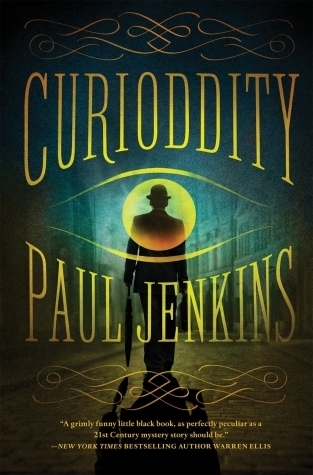 Paul Jenkin’s debut prose novel is a bit of a surprise, to be sure. I’ve been following his work as a comic book writer since his Hellblazer days and Curioddity is quite different from what I had expected when I first heard that he wrote a book. It’s a little hard to describe, since it has some elements from everywhere, including urban fantasy and even a little bit of magical realism. It’s also somewhat off-the-wall and weird. The reader’s mileage will therefore vary, as it’s so often the case with books like this. If you enjoy unusual stories or eccentric humor in the style of Douglas Adams’ Hitchhiker’s Guide to the Galaxy, then you might want to pick this one up. Okay, that one got a chuckle from me. But a constant barrage of that can also get a little distracting, I’ll admit. I also don’t typically do so well with wacky plots and characters, and getting into this novel took time. Like I said, parts of this story reminded me of a children’s tale, and at times the book read like one too. There were flashes of cleverness, but also moments where the juvenile scenarios or Wil’s groan-worthy similes made me roll my eyes. It’s not that I didn’t enjoy Curioddity though, because I did. Jenkins is clearly a talented writer and he can spin a good yarn. However, I’m also pretty sure I’m not the ideal target reader for this book. And you know what? Considering how well I did with it in spite of that, I would say that’s a win. Though its style sometimes ran counter to my tastes, the book’s whimsical message is something that will stay with me for a long time, as will its heartwarming conclusion. Bottom line, if you think his style will be a good fit for you, then I think you’ll love this one to bits. I got to get busy on my review but I think you’ve really summed this book up nicely. This book fell somewhere in the middle for me. The beginning was rather slow and I think it sped up a lot more once Lucy was introduced. Not to mention I love Lucy’s driving habits and capabilities. It’s never a good sign when I am looking to see how much is left in a chapter – and I don’t mind long books, or long chapters for that fact but for some reason, these seemed to drag on forever! Hopefully I’ll have my review up Thursday. I think falling “somewhere in the middle” is pretty accurate for me too. Lucy was a riot! But even her wackiness got on my nerves after a while. I enjoyed the first half of this book, but like you, after a while I just kept checking how much I had left. This isn’t my typical kind of read, and while I had fun with most of it, I think I can only take this style in small doses. I tend to have a hard time with that kind of quirky writing. I’m probably too scattered of a reader all on my own. I did see this one but decided I just had too many books to consider it – I’m still playing catch up. Not quite sure it would be for me tbh although I do like Hitchhikers Guide so I guess you never know. Yeah, I see that many others have also compared this one to Hitchhiker’s Guide so who knows, it might work! I’m really kind of digging the cover of this one. It keeps catching my eye on various blogs. Sorry that this one didn’t knock your socks off. I’m all for quirky humor and unusual stories so I might give this a shot. The synopsis hooked me so I think this might be one I’ll enjoy though the random breaks in scenes might throw me off. Sounds like it’s wacky so that will appeal to me. If you enjoy wacky, then I think you will enjoy this!